PORTLAND -- It was a great streak while it lasted. After defeating the Lakers 16 straight times, a streak covering a span of 1,706 days, the Trail Blazers dropped their first game to Los Angeles in nearly five years with a 114-110 loss in front of a sellout crowd of 19,848 Saturday night at the Moda Center. "It was a good comeback, came up a little short obviously," said Trail Blazers head coach Terry Stotts. "It was one of those night shooting the three, I thought we had a lot of good looks that didn’t drop. It’s one of those games. But I was pleased with how we came back and got within striking distance. We had our chances at the end." Portland is now 6-3 overall and 3-2 at home this season. The Trail Blazers looked as if they had a great chance of extending their streak versus the Lakers to 17 games after going on a 20-5 run in the first quarter to take a 22-12 lead with 4:15 to play in the first quarter. But the Lakers bench would get the visitors back in the game, going 16-7 to end the quarter to cut the Trail Blazers’ lead to 29-28 going into the second quarter. But after playing to a duel in the second quarter, the Lakers absolutely demolished the Trail Blazers in the 12 minutes immediately following the halftime intermission. By time the third quarter was over, the Lakers had outscored the Trail Blazers 32-16 on nearly 60 percent shooting in the quarter to take an 88-73 lead into the fourth. After Los Angeles extended their lead to 20 early in the fourth, Portland went on a late-game run thanks to seven Lakers turnovers and some timely shotmaking from CJ McCollum and Damian Lillard. The Trail Blazers would ultimately cut the Lakers lead to 109-104 with just over a minute to play in regulation. But between trading baskets and coming up on the wrong side of a few close calls from the officials, they were unable to make up enough ground to force overtime -- due in large part to shooting just 6-of-35 from three -- let alone secure the win. 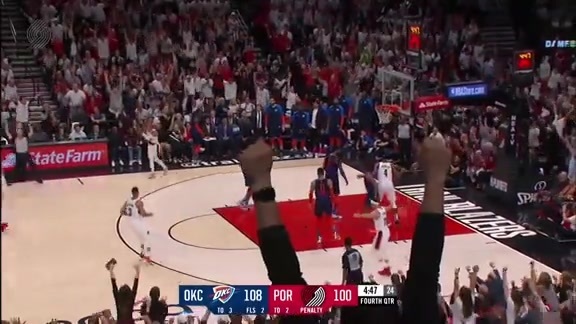 Damian Lillard finished with 30 points on 10-of-23 shooting from the field and 2-of-9 shooting from three, four rebounds, four assists and three steals in 36 minutes. It was Lillard third game with at least 30 points this season. CJ McCollum also finished with 30 points, though he also had a difficult time hitting from outside, going 2-of-8 from three. McCollum also added five rebounds and four assists in 36 minutes. Jusuf Nurkic got his fourth double-double of the season with 14 points and 13 rebounds to go with two blocks and two assists in 30 minutes. Al-Farouq Aminu also grabbed 13 rebounds while also logging four points, two assists and two blocks in 32 minutes. 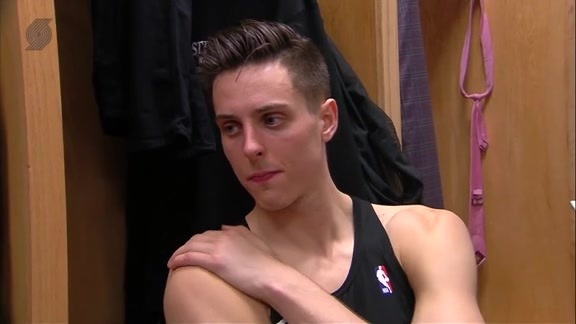 Evan Turner and Zach Collins combined to score 21 points of the bench. The Lakers were led by LeBron James, who went 9-of-20 from the field for 28 points to go with seven assists and five rebounds in 31 minutes. Rajon Rondo added 17 points, 10 rebounds and six assists in just under 26 minutes. Kyle Kuzma and JaVale McGee each added 12 points. • Portland outscored the Lakers 37-26 in the fourth quarter, but came up short as the Lakers defeated the Trail Blazers for the first time since March 3, 2014. • The Trail Blazers scored a season-high 19 fast break points while the Lakers scored 17 fast break points. • The Trail Blazers recorded 10 steals while the Lakers had nine. Los Angeles had 11 blocks to Portland’s five. • Both teams had 50 rebounds. The Trail Blazers outrebounded the Lakers on the offensive glass, 16-9, resulting in a 17-14 advantage for Portland in second chance points. • Portland and Los Angeles both recorded 20 assists. The Trail Blazers won't have long thing about Saturday night's loss, as they host the Minnesota Timberwolves Sunday night in a rare all home back-to-back series. Tipoff is scheduled for 6 p.m.